The Pull down stairs for the attic were added in the master closet, an out of the way spot for this opening that keeps it out of sight for the most part. It is a simple wooden step ladder that is easily folded and stores away in it spring-loaded opening. The main reason why most people fail to make the best use of their attic space afforded to them is their lack of access to the area. If you want to be able to use your attic as storage, for example, then the only thing that you have to do is to walk into your local home improvement store and to pick among the different attic ladders that they offer. You will not even have to hire professional help to install attic stairs in your home. In exchange for a small amount of investment, you will be able to access your attic and use it as you see fit. However, you should see to it that you limit yourself to choosing only attic stairs options constructed with high quality materials. Since you would be resting your whole weight on these stairs when you try to access your attic, you have to ensure that it will be able to support your over-all weight. There are many highly reliable options in the market. Just make sure that you choose one that will be able to give you the access that you need without causing you to go over budget. High quality attic stairs will allow you access to an otherwise unreachable area of your home, but this does not mean that the stairs would have to be accessible all the time. Since there is a possibility that you will rarely need access to your attic, it will do you well to choose among the retractable models that are available to you. High quality stairs are very easy to extend and to retract. You should not have any problem in using your installation as long as you install the parts properly. Make sure that you get a clear scope of the area and decide where you are going to place your attic stairs. Obviously, you need to install it in an area that will allow you the easiest access to your attic without getting in the way of things. Get your measuring tape and get the exact measurements of the height of the stairs that you will need as well. Try to buy stairs that are a little bit longer than you need, to ensure that your installation will be stable and safe when you use it. The type of quality attic stairs that you buy should also complement the type of materials on your ceiling. Granted that you have already installed necessary flooring for your attic, you have to see to it that you choose among stairs that will adhere best to your ceiling. Of course, there are models that only require being rest onto your attic entrance. However, resting models are less stable and less sturdy than installed models, so make sure that you buy the latter if you can afford it. You need to ensure that you will buy high quality attic stairs because it will be your main method of getting access to the area. Obviously, it will be impossible for you to reach your attic and all the things that you have stored in it without using the stairs. While the sturdiest models will set you back by a larger amount of money, they will also help you do away with the need to buy new stairs after a short while. Limit your options to attic stairs that you will be able to use for a good number of years without showing any signs of wear and tear. 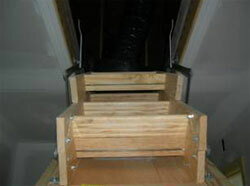 This will ensure that you will be able to access your attic and use it effectively.